To celebrate the 10th anniversary of the Penny Readings, The Reader Organisation is putting on its biggest event to date and hosting The Penny Readings Festival in St George’s Hall – and it’s this weekend! Join us for an afternoon full of festive reading and fun from 1.30-5.30pm, all completely FREE. There’ll be loads of chances to get creative and show us your artistic talents by designing a cover for your favourite book, make festive finger puppets and help decorate our Readers Christmas tree, as well as games and reading quizzes to keep you entertained and thinking. The Christmas marketplace will give you the chance to finish off your Christmas shopping, with lots of brilliant books from News from Nowhere and The Reader Organisation, as well as beautiful and unique jewellery and crafts. You can find out more about what we do and our various projects, tuck into some yummy food at the Christmas cafe and satisfy your sweet tooth with Just for Kids Cakes. Plus there’ll be entertainment in store including the chance to get creative with the Wild Writers and enjoy some beautiful music from our Penny Readings guests the i Choir. And of course, no TRO event would be complete without a Reader Raffle with an array of wonderful prizes on offer, including gifts from Independent Liverpool. Along with Publiship, the Penny Readings Festival will be sponsored by Liverpool Learning Partnership who we’re joining forces with alongside Liverpool City Council to make 2014 Liverpool’s Year of Reading. Being a reader who reads for pleasure in and out of school is the most important factor affecting a child’s future chances, and so to make every child who leaves primary school a reader, we’re looking to build a City of Readers. Our Give us 5 for Reading! campaign starts in February, but you can pledge to Give us 5 at The Penny Readings Festival, whether it be 5 minutes spent reading in our YouTube booth, 5 hours to be a City of Readers volunteer or 5 books to donate to our work with young people. Find out more about Give us 5 on the day. 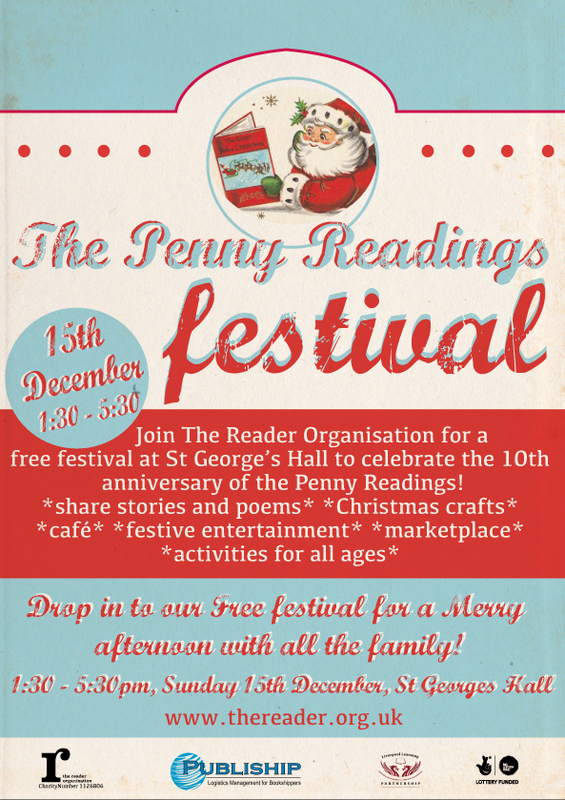 Everyone is welcome to join us for The Penny Readings Festival, this Sunday from 1.30pm – start off your Christmas the Readerly way! As the long summer holidays continue in full swing, there’s no better time to get children hooked on one of the many fantastic series of books currently available. Our regular Recommending Reader Marianne returns with some of her favourites for kids of primary age right up to teens, giving them lots to stay occupied while school is out. Remember, you can take a look through all of our previous Recommended Reads for Children here on The Reader Online. J. J. Tully is a former search-and-rescue dog, and even though he’s retired, he’s tough and knows the business. So he doesn’t like the chances of finding two missing chicks for their mother and siblings (who look like popcorn on legs). But with a cheeseburger as his reward, J.J. is going to do his best. An absolutely hilarious mystery for new readers and a great read aloud. The target audience, as well as adults who read this novel, are in for a treat! Don’t miss the sequel The Legend of Diamond Lil: A J.J. Tully Mystery. Ivy and Bean couldn’t be more different but end up becoming best friends. Together, these 7-year-olds share all kinds of adventures in this popular early chapter book series (9 books in the series so far). There escapades often get them into trouble but always involve fun. Vibrant characters and lots of humor make this a charming and addictive introduction to Ivy and Bean. These books are just right for kids moving on from beginning readers. Don’t miss these clever books about a misfit group of children recruited to save the world by the Mysterious Mr. Benedict. Written in a Dickens-meets-Roald Dahl style with loveable characters and a kindness running throughout I was enthralled from the first page. The books are pretty long (500 pages long in fact) but are filled with challenging puzzles and wacky adventures that will keep readers busy all summer long. Discovered running wild in the forest of Ashton Place, the Incorrigibles are no ordinary children. Luckily, Miss Penelope Lumley is no ordinary governess and embraces the challenge of her new position to tame their canine tendencies. How the children were found like this is just one of the many mysteries Miss Lumley must solve. Full of wonderful Lemony Snicket-humour this book is storytelling at its best and leaves the reader rushing to read the next installment! The fourth book of this series is published early 2014. It’s 1952. Janie Scott has to move from California to London with her parents. She’s not thrilled at the prospect but soon forgets her homesickness when she stumbles upon a mysterious apothecary, his handsome son Benjamin, and a murder! Maile Meloy’s Apothecary is a wonderful mix of historical fiction (post-WWII Britain, cold war spies and knee socks) and fantasy (mystical book, magical spells and impossible adventures) that culminates in a race to save the world. A fantastic gem for Harry Potter fans! The Apprentices is the much anticipated sequel. In the future it is forbidden to have more than two children, and the Population Police are there to ensure everyone follows this law. Luke is a third child and has been forced to spend his life in hiding. He is alone in the world – until he sees another child’s face in a window where two known children already live. Luke is pulled into an underground network of Shadow Children where adventures follow. This is the gripping first book in the bestselling Shadow Children series. Set in an unknown future, at the age of 16, every citizen must choose in which faction of society to spend the remainder of their lives practicing: The Honest, The Selfless, The Intelligent, The Peaceful or The Brave. Tris was born among The Selfless but chooses to join The Brave, and as part of her initiation she must learn to embrace danger and control her fears. The biggest risk she takes by far however, is the secret she keeps – a secret that could have her killed or worse. There are a number of dystopian novels recently published since the huge success of the Hunger Games Trilogy and in a future post I will recommend some of my favourites. Divergent caters to the crowd who want more action in their dystopias. And action this novel delivers! What an exciting read for boys – and girls! Three children are trying to escape France during World War II just as the Germans are invading. Their only hope lies with Charles Henderson, a British spy who is kind but deadly! This series is a prequel to Robert Muchamore’s gripping Cherub Series which is very much worth a read too. You can buy any of these books through The Reader Organisation’s Amazon Bookshop link or track them down in your local independent bookshop: you can search through The Bookseller’s Association website to locate the one closest to you. Liverpool author Deborah Morgan will be signing copies of her debut novel Disappearing Home at Waterstones Liverpool One on Saturday 9th June. 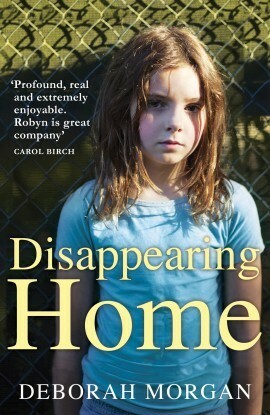 Published in March 2012 by Tindal Street Press, Disappearing Home tells the story of ten year old Robyn, who lives in a second-floor flat in a rundown Liverpool tenement block and has developed a skill for shoplifting. Happy to take the punishment given to her at school, she is much more frightened of life at home with her violent father. Though she is offered comfort and hope by her fun-loving grandmother, the intense cruelty of her her home-life causes Robyn to flee to her nan’s flat, houses of friends and a women’s shelter with her mother. But can she overcome all of her obstacles and emerge to find a better life and a lasting home? 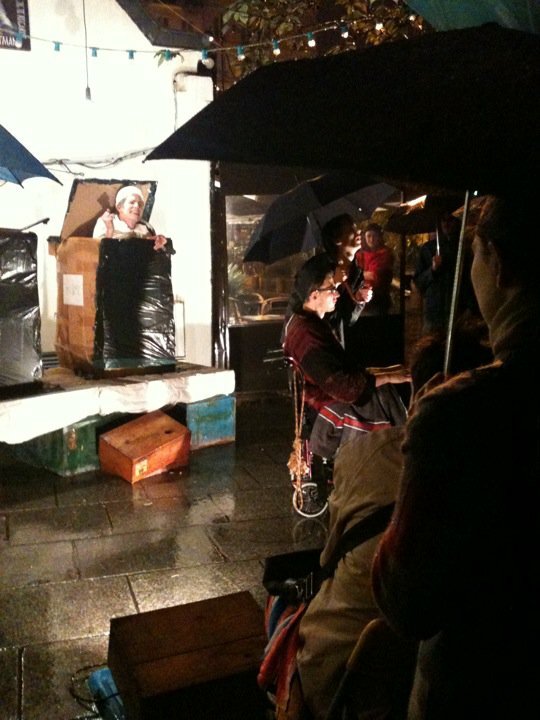 The first chapter of Disappearing Home was a runner-up in Pulp Idol, the contest for emerging writers at the Writing On The Wall Festival 2010, and was written with encouragement from legendary film-maker Terence Davies. The book has earned plaudits from local writers Alan Bleasdale and Jimmy McGovern and captures vividly the voice of a resourceful and courageous child in compelling fashion. Deborah will be appearing at Waterstones Liverpool One, 12 College Lane, Liverpool L1 3DL on Saturday 9th June 2012 from 2pm to 5pm. For further details, please contact the store on 0151 709 9820. News From Nowhere are holding a special evening event on World Book Night – Monday 23rd April from 6pm-9pm – to allow literature lovers to celebrate the momentous occasion surrounded by tons of books. They’ll have 25 free copies of one of the World Book Night books, Good Omens by Terry Pratchett and Neil Gaiman, to give away on the night, as well as a communal book display for readers to show off the books they love, a range of one-minute readings from favourite books, consolation prizes for those who don’t manage to snap up one of the 25 free copies of Good Omens and refreshments for all. Whether you’re a seasoned booklover or you’ve never been in a bookshop before, this night is for you – you can browse, buy or just soak up the bookish atmosphere. It’s also Shakespeare’s birthday, and we’re sure he could think of no better birthday party than sharing in the joys of books. I was at BBC Radio Merseyside reviewing this morning’s papers earlier today (a lot earlier today!) and amongst all the stories about Liam Fox and the Euro Millions winners, I found a hidden gem: The Hive Network. I don’t know if any of you have heard about this yet and I am just way behind the online times but it’s brilliant. The idea is that you order your books online and collect them from your local independent bookshop. This may mean more sales for publishers and bookstore owners as people come through the doors but above all that, it means that local bookshops become a place for people to connect with other people, not just a faceless website. Hopefully, this will help reverse the trend of the last few years that has seen indies closing down at a rapid rate (a quarter of them since 2006) and reinstate the local bookshop as a community hub. Now then, what to buy first…? 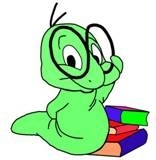 Are you a bit of a bookworm? Want to test your literary expertise? Well, here’s your chance! Linghams Booksellers are holding a literary quiz night on Wednesday 22nd June, from 19.30 – 21.30. Entry costs £5 and includes a glass of wine, nibbles and 10% off any full price item in store. The quiz is open to teams or individual competitors – why not bring your book club along and prove you know your Dickens from your Dostoyevsky? Tickets are available to buy from Linghams Booksellers, 248 Telegraph Road, Heswall or call 0151 342 7290. Paris has a history of great revolution; Shakespeare and Company is a wonderful bookshop, what better place to bring our own Reading Revolution? 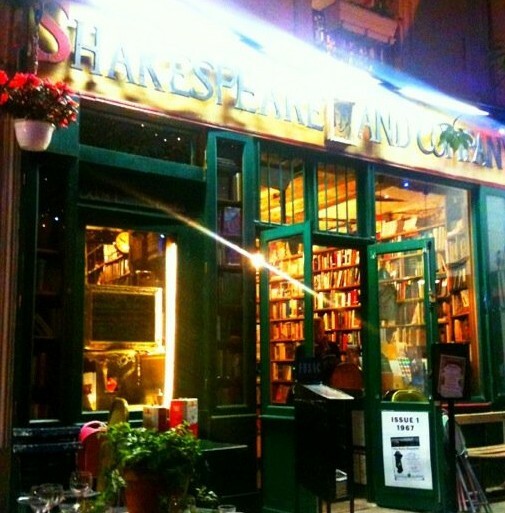 We have recently returned from a stay at Shakespeare and Company, a wonderful bookshop situated in the heart of Paris. It is a rambling building which looks like something out of a fairytale – with its books stacked from floor to ceiling, the walls themselves seem about to collapse at any moment under the sheer weight of literature. In short, it is a readers paradise, the perfect place to while away the hours browsing the new stock downstairs, or exploring old editions in the library above. During the week we stayed there, we lived, worked, and breathed the bookshop – sleeping among the bookshelves in the Tumbleweed Hotel. The bookshop was opened in 1951 by George Whitman, an ex-pat American, who settled in Paris after the war. It takes its name from the original Shakespeare and Company opened by Sylvia Beach in 1919, which was home to Joyce, Hemingway and Fitzgerald. 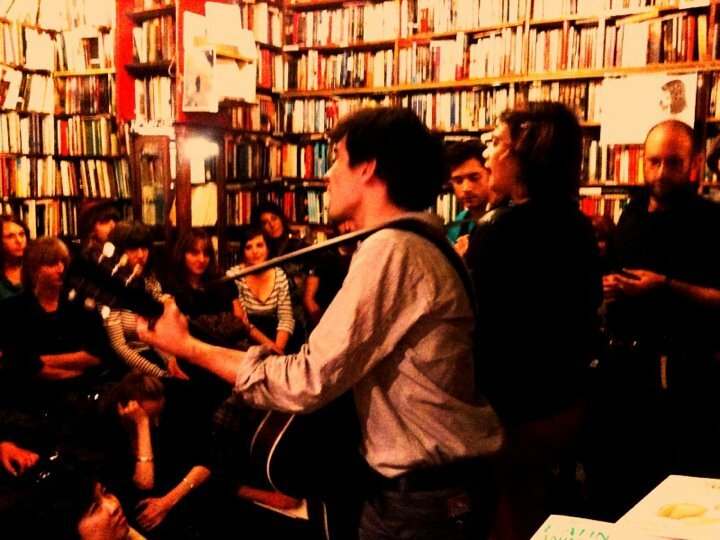 … and acted as stewards at a gig that took place within the bookshop, headlined by American/French band Moriarty (named after the hero of Jack Kerouac’s On the Road). 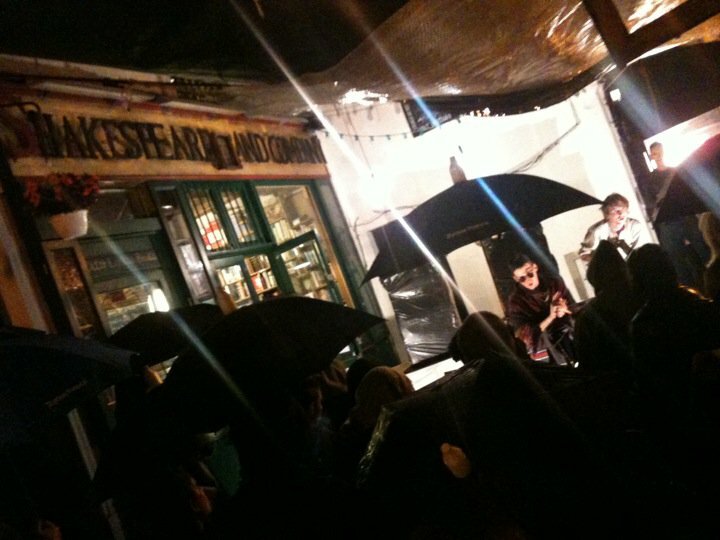 'Moriarty' perform at Shakespeare & Company. As well as these almost daily events and readings, this summer Shakespeare and Co hosted their biennial literary festival with readings from, amongst others, Martin Amis, Will Self, and Jeanette Winterson. The Highlight of our trip however was on the Thursday afternoon, when we held a Get Into Reading group with our fellow tumbleweeds. We read Anton Chekhov’s The Bet, and the poem Leaves by C. K. Williams. The group took place above the bookshop in the library, and being surrounded by so many books certainly helped set the mood. Despite one or two confused tourist popping their head into the room (and perhaps wondering what we were doing. Reading together? Out loud? ), we weren’t able to tempt any of them to sit down with us and join in. Maybe next time – as we are hoping to return for another visit in 2011. Watch this space.